Please welcome our new SBLive! advertiser "Madison Square Garden Restaurant". Thank you for choosing SBLive! Welcome Great place to advertise. Hey this looks like a good place to have a good meal at a good price. When I was just a young man I worked at Brookshires at Madison Park. Question ? Same owners or new ? Last edited by Isaac-Saxxon; 08-22-2007 at 02:20 PM. Has anybody eaten here? If so, give us a review. I used to eat there all the time.. but this would have been back in the late 80's early 90's or so... used to work there in that Gilbert office center, was right next door to Madison Square Garden. The food was definitely great back then.. but I haven't been there since then. Ditto, but I'm glad to be reminded of it and will go back again and check it out! Welcome aboard! 3 cheers for the Historical Photos group talk about an area of shreveport, and BAM, there's a picture. Last edited by LateNight; 08-23-2007 at 12:03 PM. There was a Brookshire's Tasty Bakery over there that I worked at for a short time after I got out of the army. This would've been circa 91'. What were your dates and location, Isaac? 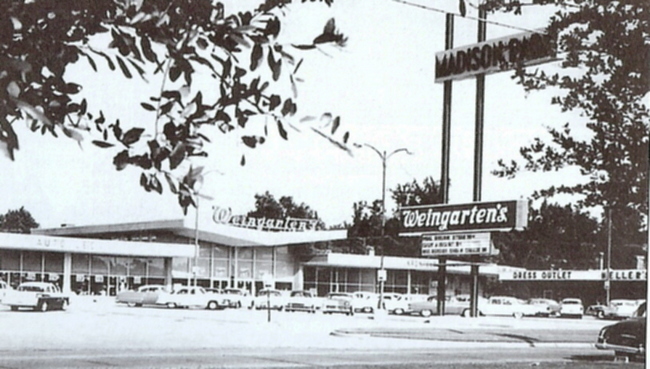 Weingarten's....now there is a memory. I remember going to the grocery store as a child there. Great pictures! They bring out fun childhood memories. Remember the Weingartens in Bossier? Right there at the intersection of Barksdale and Airline, where Ellis Pottery is. Yeah, those are some good memories. If anyone goes there, it would look good for SBLive! to tell say that you heard about the place here at Shreveport.com. Hey Al! Do you remember Gibson's off of Hearne? Or how about T.G. & Y.? Anybody remember shopping there? I haven't eaten at MSG in a few years, but we used to go all the time and get burgers and cheese fries. It was my little brother's favorite restaurant, but we stopped letting him pick restaurants after he took us to some gay sports bar out on Youree Drive. I'm never really driving by it so I don't really think about it much. Maybe SBLive will jog my memory. I think Brookshires was across the street (fern? ockley?) from Madison Park next door to El Chico's. Bought my first box of "space food sticks" from that Brookshires. Also plenty of grape and rootbeer Fizzies!